trasform data in one table. I have a huge table, 1992 columns x 35.655 rows and I would like to trasfotrm all of them in l 2^x and create a new table (ok I can skip this, I can save it with another name). If I select data from anothe column in the same formula it works, but obviously it is not good. Re: trasform data in one table. 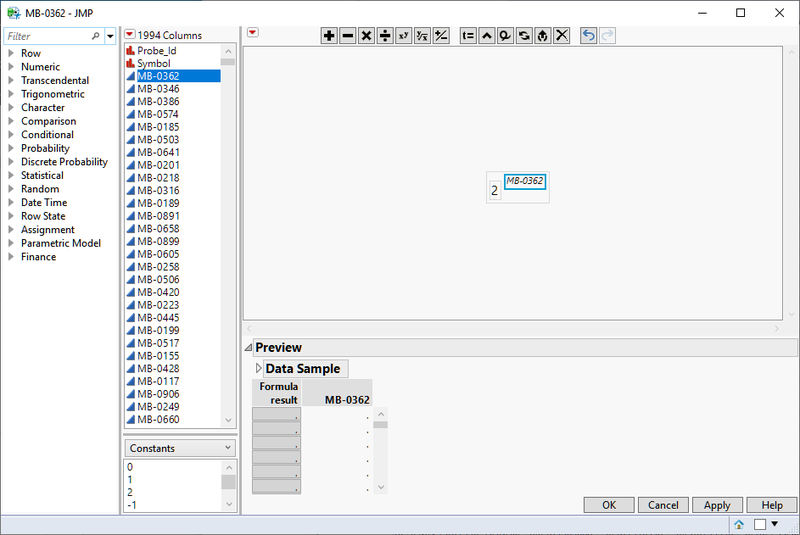 If you have a later version of JMP that supports the data table matrix syntax, this approach would be efficient for replacing all data with their transformed values. The code assumes all columns from column 3 to end of table are numeric (as in the screenshot). thank you very much, it works perfectly!